The 2010 International Home and Housewares Show rolled into Chicago's McCormick Convention Center this past Sunday. The annual trade show offers retail buyers the opportunity to see the latest in consumer lifestyle and product trends for all areas of the home, both inside and out. Since the show, David Gregg, senior editor at BehindTheBuy.com, has been busy checking out some the not new products that will be hitting your local home merchandise retailers in next few months. He shared some of his favorites on "The Early Show." 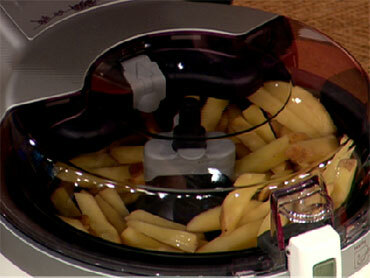 This product, which is actually available now, is like a deep fryer, but much healthier. All you need to do is add just one tablespoon of oil to cook a wide range of food. So we have some fresh cut potatoes here to make French fries. There's a paddle inside, which mixes the food around and a heat pulse system that blows around heat so the food cooks evenly. It's easy to clean, all parts are dishwasher safe, and it's safe and easy to use. And it can be used for a wide range of foods: meat, fish, risotto, vegetables and fruits, etc. It even comes with this recipe book. Another new item hitting the market is this easy-to-use ice cream maker. Here's how it works: You put the bowl in the freezer for a few hours so it's nice and cold. Then just add fresh ingredients (for "The Early Show" batch, we used 2 cups of half and half, 1 cup of heavy cream, 1/2 cup sugar and 1 and a half teaspoons of vanilla extract.) Mix it together so the sugar dissolves, then just add it to the freezer bowl and turn on the machine. It takes about six minutes to make a bowl and you can personalize concoctions with fresh fruit, nuts or chocolate chips. Also, for dieters: you pick the ingredients, so you can custom-make your frozen treats with less sugar and fat. Cost: $30, available in a variety of colors. The new trend with a lot of the pots and pans at this year's show is ceramic-surfaced. What I like about this product is its environmentally-friendly, ceramic-surfaced, and of course, non-stick with minimal environmental impact and no health hazards. The handle on the new pan is attached by rivets which will never loosen and allows the pan to be placed in an oven set at any temperature, even broil. The stay-cool handle is constructed from cast stainless steel with a silicone grip. It's also composed of 99 percentt recycled aluminum, and the non-toxic ceramic coating is designed to retain heat longer. These are rechargeable Salt & Pepper Mills from Cuisinart. They're adjustable so you can make your salt and pepper coarse or fine. And check this out: They even light up the food so you can see how much salt and pepper you're putting onto the food! You can also use the pepper grinder for spices. Check out this new vacuum cleaner. It functions like any other handheld vacuum cleaner, but it has a UV light, which sanitizes household surfaces, such as upholstered chairs and sofas, bed mattresses and pet areas. This Bed Vac eliminates up to 99.9 percent of viruses, bacteria, germs, mold, dust mite and flea eggs on household surfaces. It has an eco-friendly bag-free design, is compact/portable, and weighs only five pounds. It has a safety feature that, when you remove the UV light from the surface, it turns off so you don't have contact with the UV light, which can be dangerous when you're exposed to it. This is called the Hoover FloorMate Hard Floor Cleaner. It's a 3-in-1 cleaner that vacuums, washes and dries hard floors with one simple to use tool. The FloorMate Cleaner's two-tank system keeps clean and dirty water separate so you never put dirty water back on the floor, and the patented SpinScrub technology with counter-rotating brushes gently scrub from all angles to get sealed hardwood, tile and vinyl floors clean. Quick-drying power gets the water up quickly so you can get back to living on them in minutes. They're fiberboard covered in a durable fabric. They will support your weight, as well as act as storage. They can also be stacked to save space or fold up easily, in a matter of seconds. The Furniture Cubes are available in two sizes, 18" and 14". This product will warm your coffee cup in advance, and keep your coffee hotter, longer. It features two individually heated cup drawers with integrated temperature control. Consumers can program the number of minutes the drawers will be heated as well as heating time for each drawer. It can also serve as storage space for your coffee mugs.